Oblong shaped with exceptionally full-flavored sweetness, Grape Tomatoes have a firm, meaty texture with no wax coating. They're picked red, ripe, and ready to eat, and they make a healthy bite-sized snack when they're not being tossed into salads by the handful. 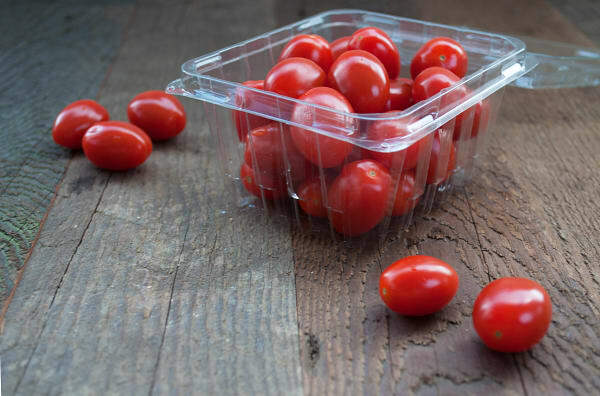 Storage Tip: Keep tomatoes at room temperature but not under direct sunlight. Preparation Tip: You can either peel and take the seeds out or just rinse and eat raw or cooked. Did you know... Most of the nutrients of a tomato are stored in the skin and the jelly-like part which includes the seeds. Culinary Compatibility: Tomatoes go well with salads, soups, sauces, pastas etc. Culinary usages are endless! Health Information: Tomatoes offer an excellent amount of vitamins E and C, folate, potassium and beta carotene. Cooked ones are high in lycopene and beta carotene.